Welcome to Attilio's Men's Clothing! Since 1956, our family-owned store, has been servicing and providing fine men's apparel for the discriminatory gentleman. 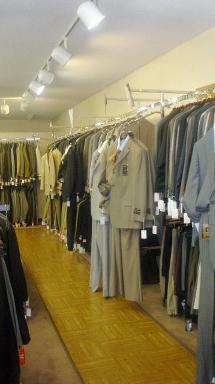 We carry fine men's suits, sport jackets, pants, and all other accessories with a slant towards European fashion. We specialize in the "hard to fit" client with expert tailoring done on the premise. Also, we provide formalwear (tuxedos) rentals and sales with an emphasis on service. In addition, we do special orders, expert alterations (women's and men's), and most other apparel needs. In short, our philosophy has been the same over the past 50 years: to provide exceptional products combined with exceptional customer service.